Back in December I had the thought that it would be fun to do an email interview with someone. As I thought about it Thomas LaRock (b/t) sounded like a good choice since he has been working in the community for quite a while and is our current Pass President. He is also an MVP, an MCM and Head Geek at Solarwinds Technology. Not to mention his obsession with bacon and his sense of humor. I’ve only gotten see Thomas speak once, at the very last session of the 2012 Pass Summit. To be very honest I don’t remember what he was speaking about. It was a long week and I was really out of it by then. He did, however, make one heck of an impression. (He threw candy at us during the presentation.) Given all of that I emailed him with a handful of questions and he very kindly replied. Sorry for the delay in my reply but Holidays. Here are my replies. I can’t imagine that my rankings have any value to anyone, including myself. I really wanted to do them in classic NCAA style, but realized that was difficult to compare two bloggers and decide if someone was better or not. So I went with group classifications and even tried to throw in some English style relegation. Maybe I’ll shake things up in 2015. Can you tell me the paths that lead you to serve as President on the Board of Directors for Pass? My first PASS Summit was in 2004. By the end of the week I signed up to volunteer. I’ve always known that doing extra work, hard work, pays off. By 2006 I was being encouraged to think about running for the Board. I ran in 2007 and lost. I ran again in 2008 and lost but was appointed to fill a vacancy for 1 year. My task that year was simple: “Do something with the Special Interest Groups (SIGs)”. The first thing I did was rename them to Virtual Chapters and get a formal chapter agreement in place for anyone wanting to start up a new VC. In 2009 I ran again for the Board and this time I won! To be fair, there were only four people running for three spots in 2009, so it’s not like I beat out a lot of folks. I continued working with the VCs a bit in 2009 but by 2010 I was more aligned with some Marketing initiatives such as 24 Hours of PASS. In 2011 I won election to be the VP of Marketing. One of the initiatives I helped get launched was the First Timers program. By 2013 I ran for President and was fortunate to be chosen to serve. You seem to enjoy bacon a little bit. What are some of your favorite bacon related items? I do enjoy me some bacon. The best bacon often serves as a complement to a meal, and not as a meal itself. Bacon mac ‘n cheese, bacon wrapped scallops, or just a slice of bacon with breakfast are some examples. But to this day my favorite bacon item would be a good BLT sandwich. I find myself looking for that on a deli menu often. Between your blog, your position on the BOD and your other activities on social media (did I miss anything?) how do you manage to keep a good work/life balance? I don’t believe I will ever have a good work/life balance. I’m always trying to switch gears between the two. I think the people who profess to have such balance are simply better at being “in the now”. I’m terrible at that. When I’m working I find myself thinking about not working. And when I’m not working I find myself thinking about work. It’s awful. About the only thing I can offer in terms of advice is to form good habits. Set aside specific times to do work and to not do work, and do your best to be in the now. You have a popular blog, are President on the BOD, an MCM and an MVP. Where do you see yourself going in the future? I’m awful at the “see yourself in the future” questions. I really have no idea. I stopped making plans a long time ago. I learned that life is what happens while you are making other plans. So these days I do my best to take opportunities as they arise and see where they may lead. If I don’t like where they are going then I make changes. It’s a lot easier this way. I can guarantee that wherever I go, data will be there. And bacon. Do you have any specific parts of SQL server that you really enjoy? There isn’t any one area I enjoy more than others. What I enjoy most is learning and sharing. Thankfully the SQL community is full of people that also enjoy learning and sharing. 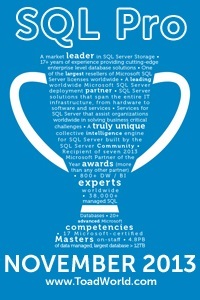 What direction do you see SQL Server taking over the next few years? Is the cloud really the next big thing or will time prove it to be just another offering? I see SQL Server as being part of a complete data platform offering. The Cloud is for real, no question, but that is just an implementation detail. I don’t need the Cloud to work with the Microsoft data stack. What I believe to be the next big thing is data analytics. I believe that people are finally going to understand the value in being able to gather and analyze data effectively. There is a dearth of people in the world that have such skills, but DBAs are the perfect people to fill those roles. We already have the analytical skills needed to break down problems into simplest terms and apply insightful questions. The days of DBAs racking servers and stringing cables are ending quickly. Corporations need analytical skills, as well as soft skills. Hard skills aren’t as big of a commodity anymore. Well, there you go. I particularly liked Thomas’ viewpoint on work/life balance and “see yourself in the future questions”. And bacon. I hope you found it interesting also.